BOWES has a Dickensian look about it – gaunt stone buildings and a narrow main street built for stagecoaches. Dickens spent some time in the village, as it happens, lodging in the Ancient Unicorn, the local coaching inn. The village academy was immortalised as Dotheboys Hall in Nicholas Nickleby. And me, I’m just passing through. 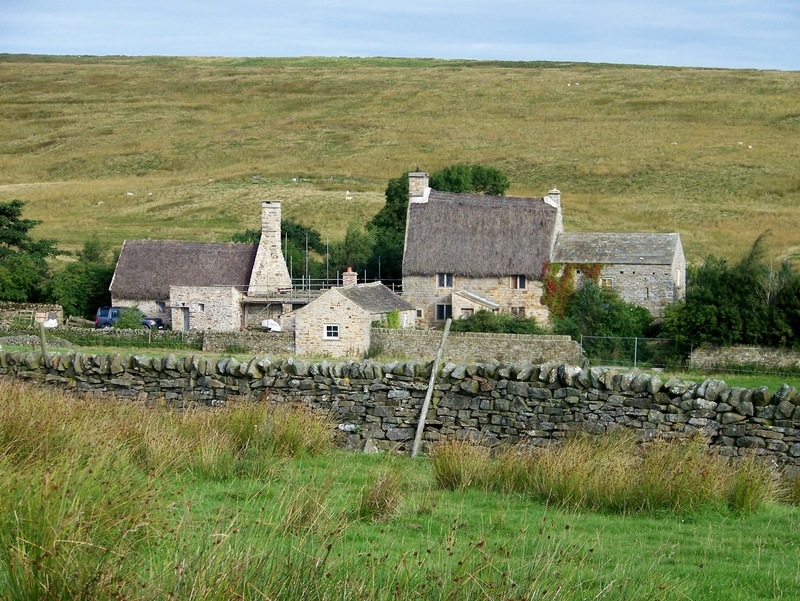 Bowes is the starting point for my Pennine trek. 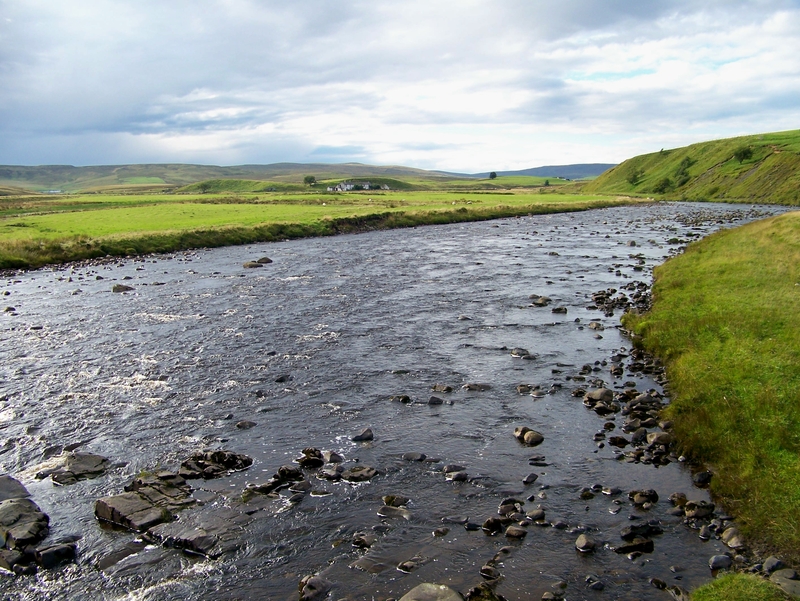 I’m heading for Hexham, which is many weary miles, two cold nights, a great deal of rough ground to the north. Off I go . 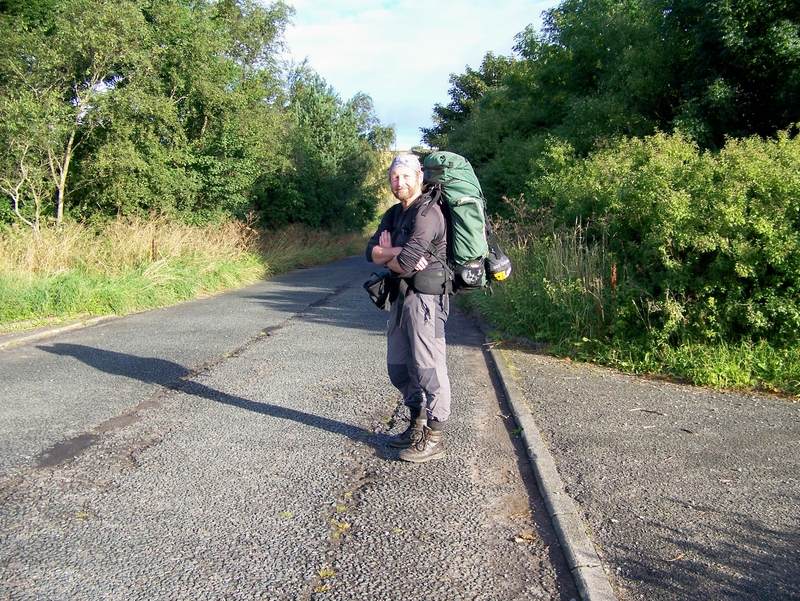 . .
Backpacking is one of those human activities – along with being a travelling street-performer or living in a yurt – that possesses a certain romance but in practice is cold, miserable and uncomfortable. When the weather is fair and sunny, the backpacker is a blithe soul striding out towards distant blue ridges. When the weather is foul, he counts down the days to his destination and shakes raindrops from the end of his cold nose while mentally computing how much he can lighten his pack by eating the heaviest processed, freeze-dried, dehydrated and atomised packet of reconstituted vegetable pasta he is carrying. Oh, and working out the distance to the nearest bus stop. Forgive me for referring to backpackers in the masculine. It’s just for convenience. In fact, the first fellow backpacker I meet on my travels is a female backpacker with a jolly disposition. 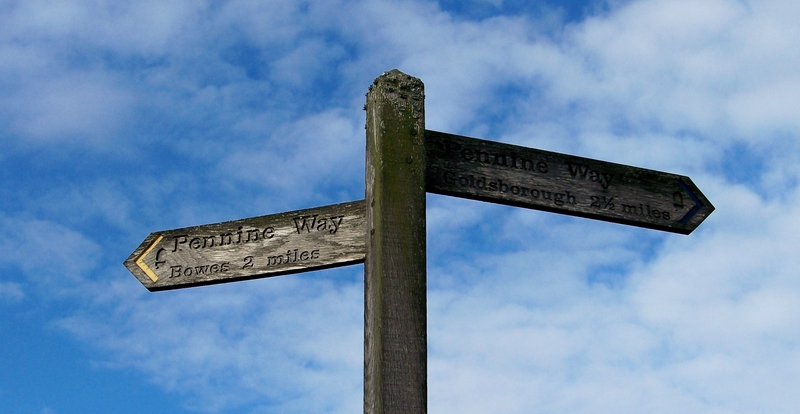 She’s walking the Pennine Way backwards – that’s north to south, not facing the wrong direction. 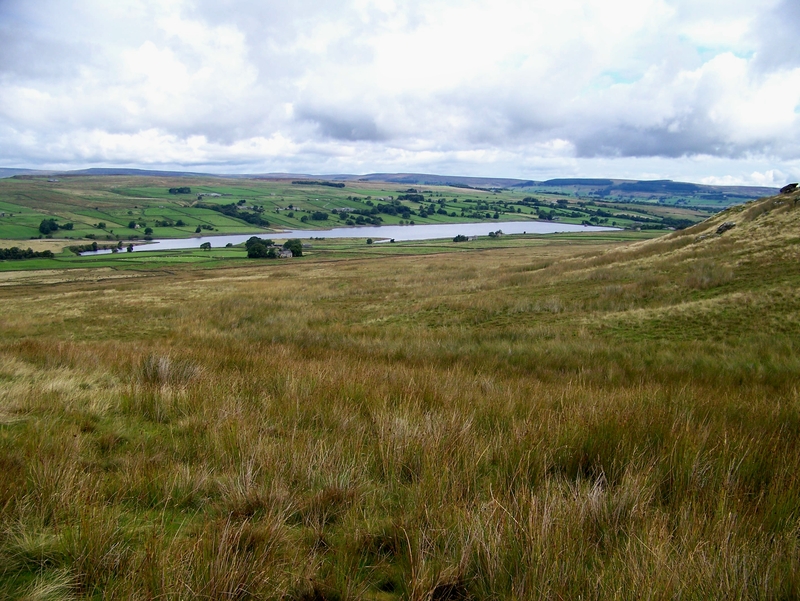 I forgot to tell you that this section of my Pennine trek follows the Pennine Way. But that’s not why I’m walking it – my doctor advised me to take this route. So I was sitting in the doctor’s surgery last week discussing mountains, fell-running and future expeditions – as you do when you’re having your blood pressure checked – when my GP advised me to start from Bowes instead of further along the A66, which had been my original intention. Start from Bowes and you walk past some isolated buildings with turf roofs, and it’s a beautiful walk, he said. It’s one of his favourite fell-running routes. So I decided I would. I always take my doctor’s advice. Except on the drinking thing. Twenty-one units of alcohol a week? Come on. Above the village allotments the moorland opens out – but this isn’t freedom-to-roam country, this is a former military establishment where chemical weapons were stored during the Second World War. I’d heard about Bowes Camp, from stories that have appeared in The Northern Echo over the years, but never actually been here. 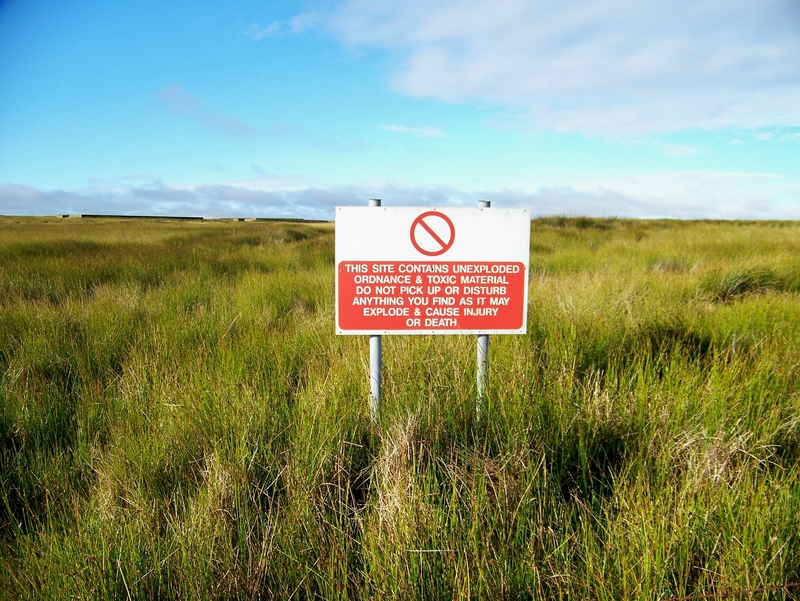 Subsequent research reveals that “the site stored weapons charged with mustard, phosgene and lewisite on an area of 564 acres of moorland. In total 17,000 tonnes of chemical agent was stored”. That’s enough to keep me on the right side of the fence. I don’t want a story appearing in the Echo about a wayward backpacker seen stumbling about Bowes Moor screaming “Gas, gas, quick boys,” rubbing his eyes in an ecstasy of fumbling – before realising after a moment of blind panic he’s inadvertently smeared midge repellent on his contact lenses. The road meanders through acres of abandoned camp. Strange ruins litter the hillsides. Dark shapes and humps interrupt the horizon. The concrete foundations of huts are everywhere – poking through turf, abutting the roadside fences, rows of oblongs along overgrown roadways. It’s the sort of place a person with an inquisitive mind would really, really, really like to poke about in. Except for the mustard gas. That’s a real disincentive. At Levy Pool I spy the steeply-pitched turf-roof buildings my doctor told me about. My blood pressure was fine, by the way. From a distance, they look more like thatch than turf roofs, but I may be wrong. Either way, they are intriguing because they are totally out of character for the northern Pennines. It’s an interesting place. Beyond Levy Pool the moorland stretches unbroken. 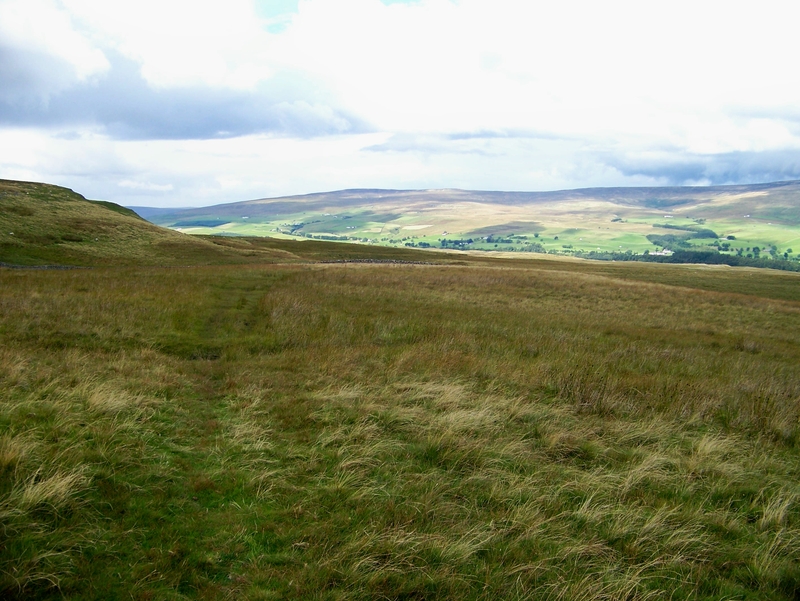 The Pennine Way is a faint track through bogland and damp grasses. The skies are big and windy. The clouds are white but gathering. 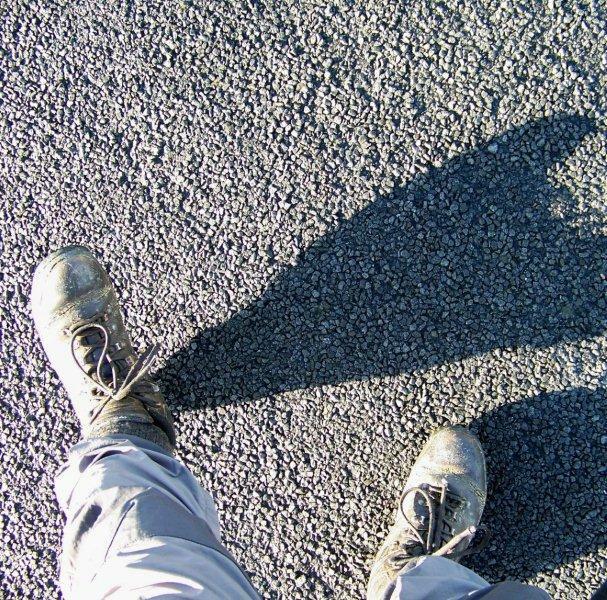 It’s a fine day for walking and fine country to walk across. 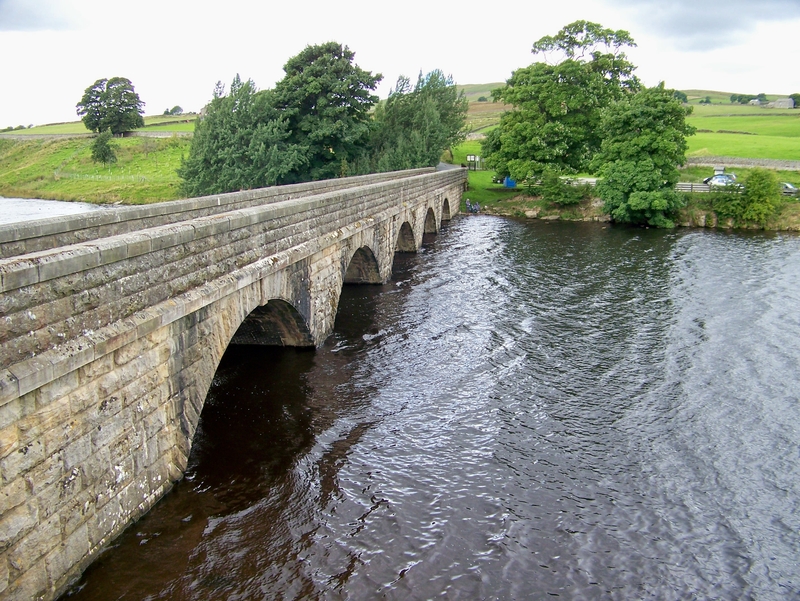 And I see no one all morning except three blokes repairing a wall at Clove Lodge, the female backpacker crossing Hazelgarth Rigg, and three anglers huddled near the grey waters of Grassholme Reservoir. I pass High Birk Hatt, where Hannah Hauxwell farmed alone for many years. Remember her? Became an overnight TV celebrity, somewhat exploited by media executives who thought it would make good viewing to pluck someone from a remote, rural environment and plonk her in the middle of glitzy London. More than a little bit of The Truman Show in that, I thought. Things are going smoothly until Wythes Hill, above the reservoir. 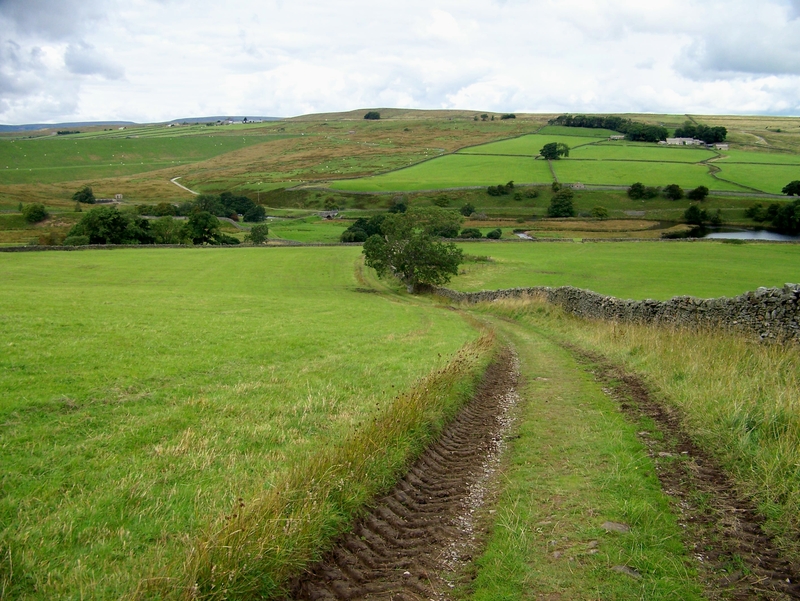 Here I leave the Pennine Way to take an overgrown bridleway across Lune Moor to upper Teesdale. It immediately starts raining heavily. I work out the location of the nearest bus stop while plodding almost aimlessly through knee-deep sedges and banks of spiky grass towards a distant hilltop. If a bridleway once existed in this loveless place, a hundred years have passed since a horse trotted its length. But salvation comes to those who strive, and on the crown of the moor the sun bursts through black clouds to reveal a cosy wooden shed built by the grouse-killing fraternity, which is ideal for taking one’s lunch. There’s even a table. Damned sporting of them, if you ask me. Things get better. 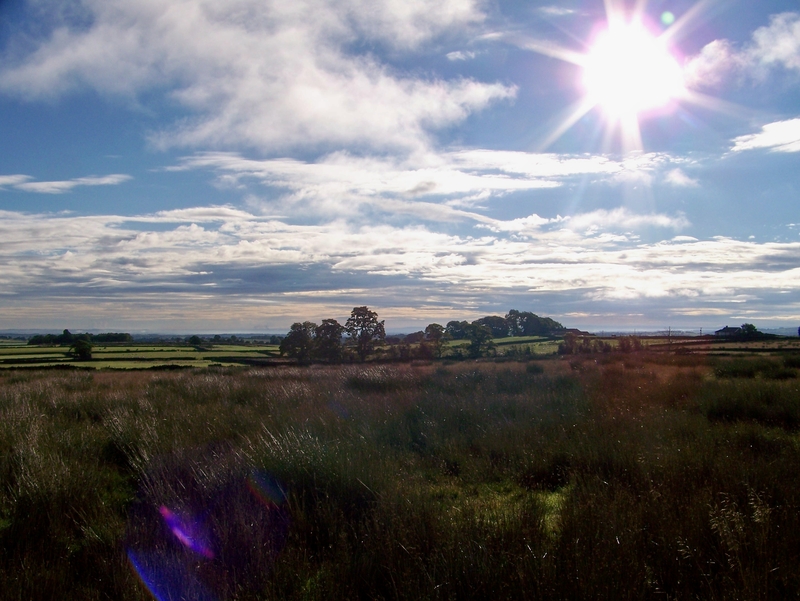 Incredibly, I’m slap-bang on the course of my unseen bridleway, and from here it exists as a faint path over Crossthwaite Common to Holwick Scars. There are some interesting topographical names in this area: Swinket Mease Rigg, Wool Ingles, Rotten Rigg, Bink Moss. These features were named back in the days when people made their own entertainment. I bet they had a right good laugh. Television spoilt all that. 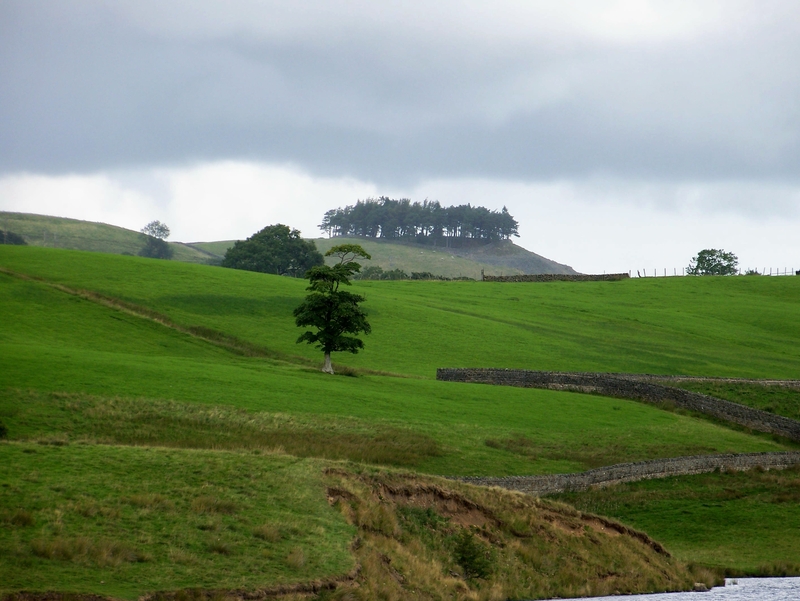 But beyond Holwick Scars, above, the rains roll back in a dirty grey curtain from the north-west. I follow the Green Trod, an old droving road, across bogland where even the stoutest boots succumb to the relentless peaty water, as the weather batters my pack and waterproofs. This wasn’t in the forecast. Cold, damp, and in low spirits, I rejoin the Pennine Way above Cronkley Farm and meet two backpackers walking the full trail from Derbyshire to the Borders. They’re in their second week. And their spirits are brighter than mine, which does rather put things into perspective. 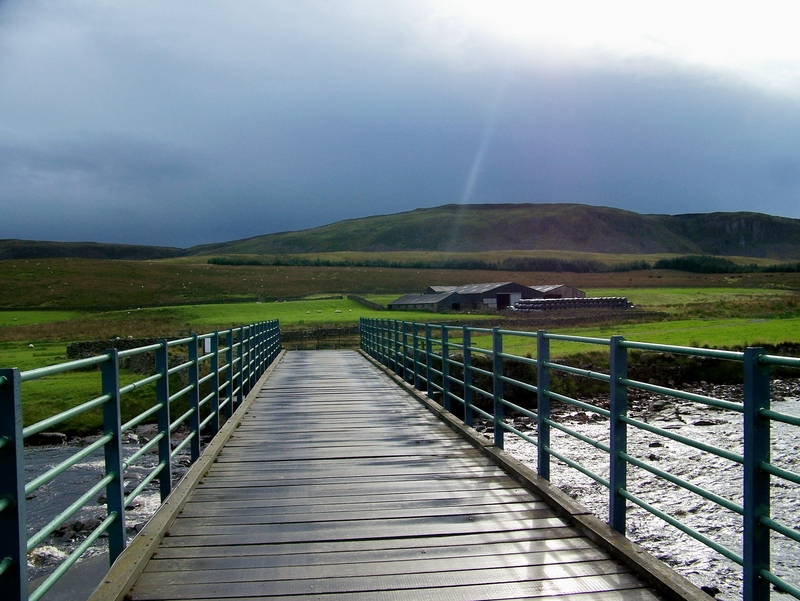 So I buck up, and we cross the River Tees on a wooden bridge as the sun once more emerges from behind rainclouds. My brightness, like the sun’s, is short-lived. 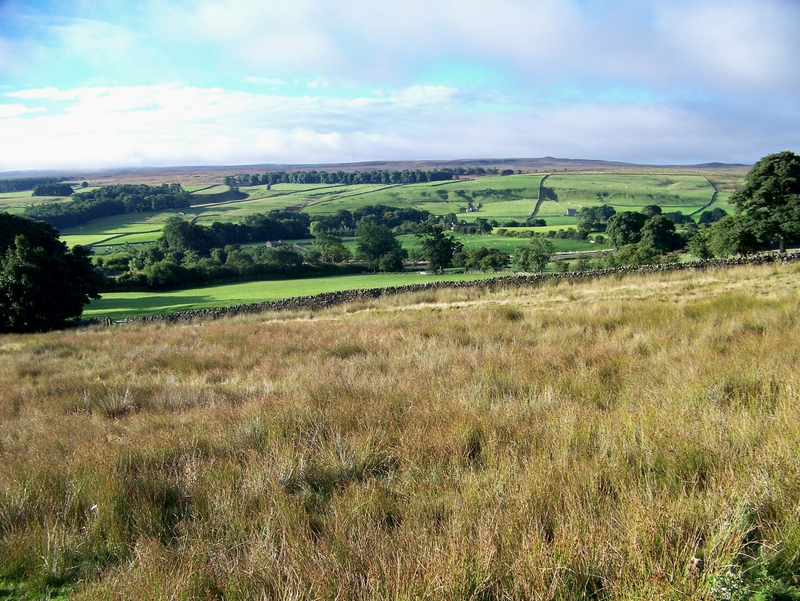 At Forest-in-Teesdale the walkers shoot off to a B&B, hot showers, hearty food and warm beds. 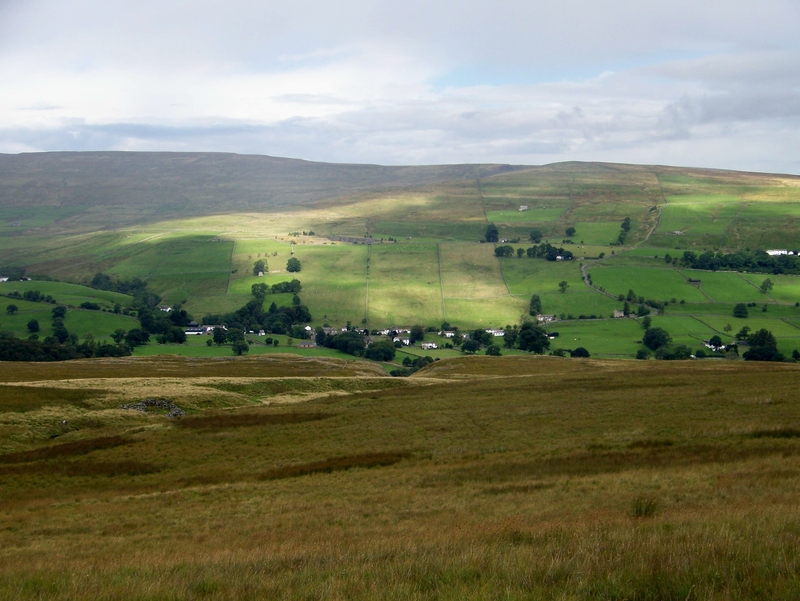 I raise my eyes to the darkness of Fendrith Hill, a great tussocky mass that separates Teesdale from Weardale – and on whose windswept, rainlashed upper slopes it is my intention to spend the night. 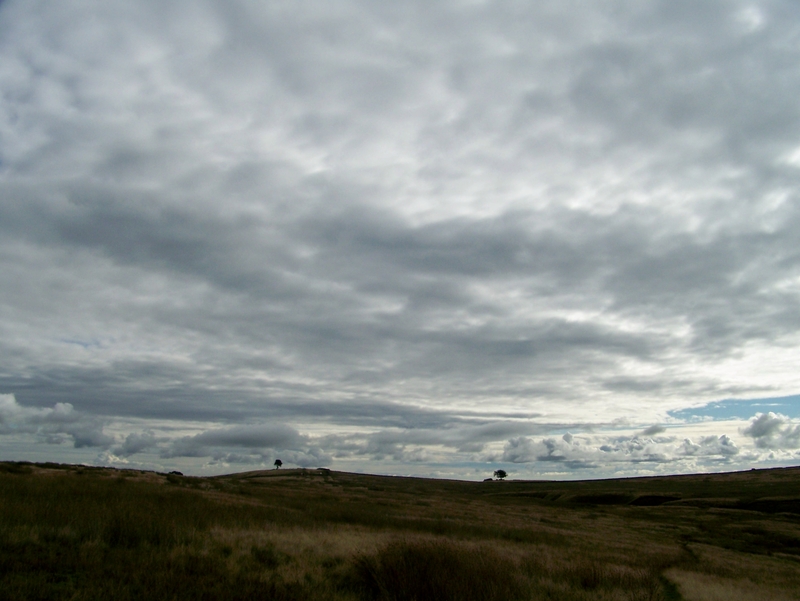 In rain and wind, and with darkness approaching, I follow and old quarry track through hillside pastures to high intak fields and rough meadow. Beneath High Hurst Edge there’s an old quarry and a patch of flat grass. I pitch the tent and crawl inside. Then as I’m cooking the heaviest meal in my pack, the clouds finally break and the evening sun comes streaming through. This is what backpacking is about. I knew there were good bits. This is where romance meets reality. These are the dreamed about, imagined fragments upon which we occasionally stumble. Islands in stormy seas. I finish my dinner, boil a final pan of tea, and watch the sun sink behind dark hills in the west. Thin clouds trail across an otherwise clear sky. Night is here, and it’s going to be a cold one. This entry was posted in Allotments, Camping, Charles Dickens, Climbing, Drove roads, Environment, Explosives, Footpaths, Hiking, History, Mountains, Northern Echo, Pennine Way, Running, Second World War, Walking, Writing and tagged outdoors, Pennines, WPLongform. Bookmark the permalink. 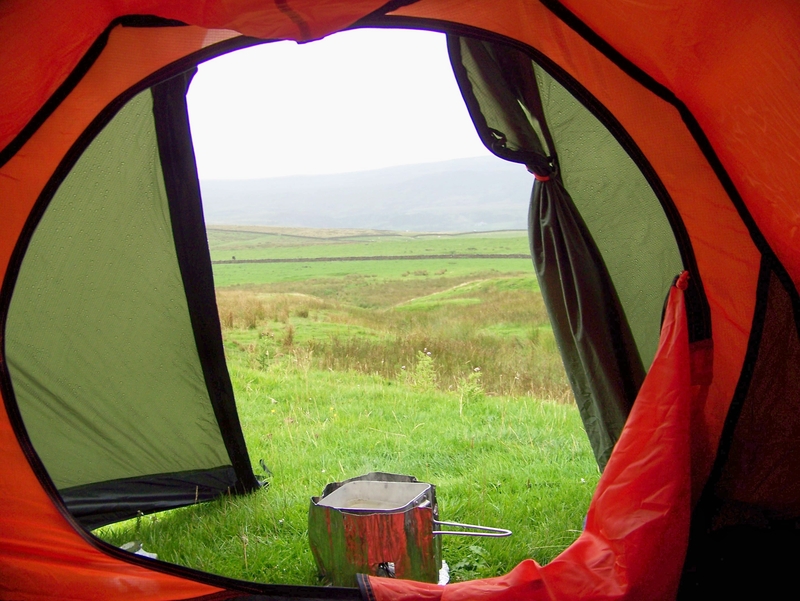 I was really jealous when you prepared your dinner in the tent door while the sun broke through the cloud cover. 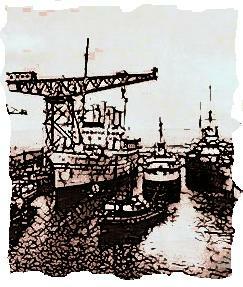 Your pictures are very evocative. Hej Hanna. Good to hear from you and thank you for your comments. I love many things about backpacking and hate many things too – such as wet clothes, cramp and pitching a tent in the rain. But the bright moments are why we do it – and they tend to outweigh the low points. I’m very lucky in that my doctor shares many of my interests, only he’s much fitter and younger than me. So we always discuss mountains and running and what plans we have for the future. And whatever my ailments are, the advice is always keep up the running and keep on climbing mountains. That can’t be bad. Hi Alen. Actually once we had a very nice married couple as doctors. We both had to have tetanus vaccine, and we came to talk about mountain hikes in Norway. It turned out that we had been on the same remote mountain and it resulted in a very, very long consultation. There you go! Doctors should all be like that. I’m alway restricted by the amount of beer or wine I can carry. Great post. Hi Keith. The trouble with drink is it’s too heavy. Someone should invent freeze-dried London Pride or dehydrated Tempranillo that you mix with water in a billy can. Can you embed video in your blog? I want to see you walking like a crowd. Ha ha. Thanks for that Mrs P. Like I said, it’s not easy. In fact, I did think at the time there was something Pythonish about the sign. It’s little things like that make the world go round. Quite a contrast between the signs. Regarding the first one, would the warning apply to, for example, a large leaf? And I suppose it would be vandalism to add to the other sign: ‘oh and while you’re at it, tuck your shirt in and no talking’. Great scenery though and looking forward to part 2. Hi Chris. I’ve been thinking about that first sign since I uploaded the post because it doesn’t actually say “Keep Out”. And it was pretty low-key fencing around the place so perhaps access is possible so long as you don’t pick up strange objects – including suspicious leaves. As for the second sign, I’m still fuming about it now. A bloody landowner telling me how to walk on land that’s in the public domain. If I go back I’ll have my shirt out and be singing the Red Flag at the top of my voice. 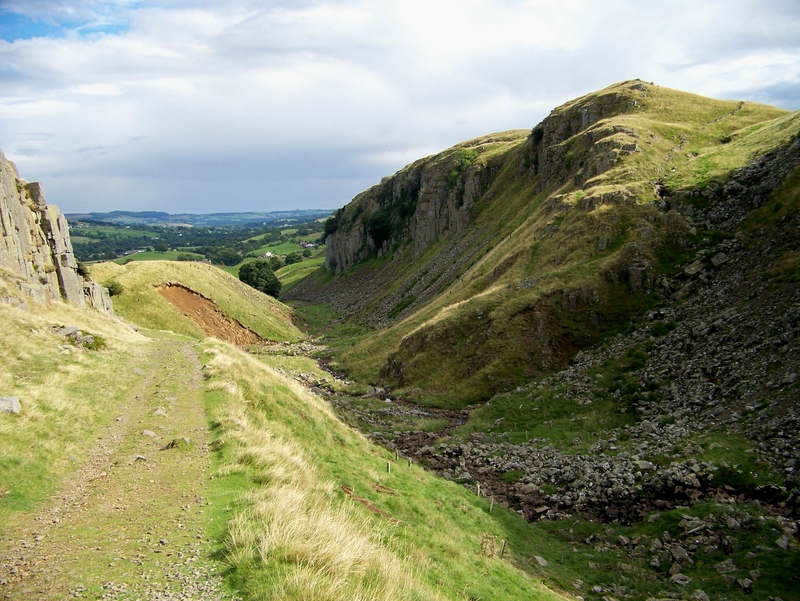 Not sure I’ll ever tackle the Pennine Way – especially now I’m older. I always saw it as a challenge too far myself! Hi Carol. I’d heard about the mustard gas a few years ago and assumed it was left over from the First World War. But a quick Google reveals that they stockpiled masses of it all over the country and even shipped loads to France during the Second World War in readiness for the Nazis using chemical weapons first. In the event they didn’t, so it all came back again. It was stockpiled at Bowes from 1942. Backpacking. It’s a love-hate thing. When it goes well it’s great. When it doesn’t it’s worse than hell. And I agree with you about the Pennine Way. Too far in one go. The best part about backpacking is putting your feet up at the end and writing about it, like I’m doing now with a glass of London Pride. I recognise Cronkley and Mickle Fell behind your tent. That’s a biggish day from Bowes and I think I would have been flagging by the time I got to your campsite. Clearly your doctors advice is keeping you fit. Mind you I find the advice of a doctor is to be heeded and ignored in equal measures. Some advice will help you live longer, while other advice will just make it seem like it. Hi David. Yes, there’s the other side of the coin when it comes to doctor’s advice – namely the alcohol intake thing, which my doctor’s always pushing! I reckon I live and eat pretty healthily, so I can bend the rules when it comes to having a drink. That’s my theory anyway. 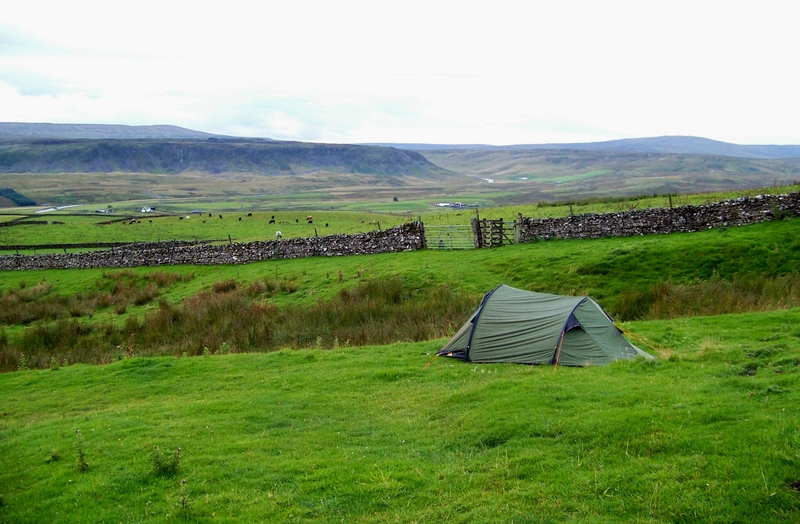 My original plan was to camp down by the river at High House, which would have been about 15 miles from Bowes, but I didn’t know camping was forbidden in the nature reserve till I saw the signs so I pushed on that final couple of miles – which was all up hill. Still, it shortened the following day’s walk. I like the idea of the cowboy walk. I shall practise my John Wayne impression. Great stuff Alen. New tent fever eh? sounds like a great trip, am looking forwards to part 2. Hi Greg. 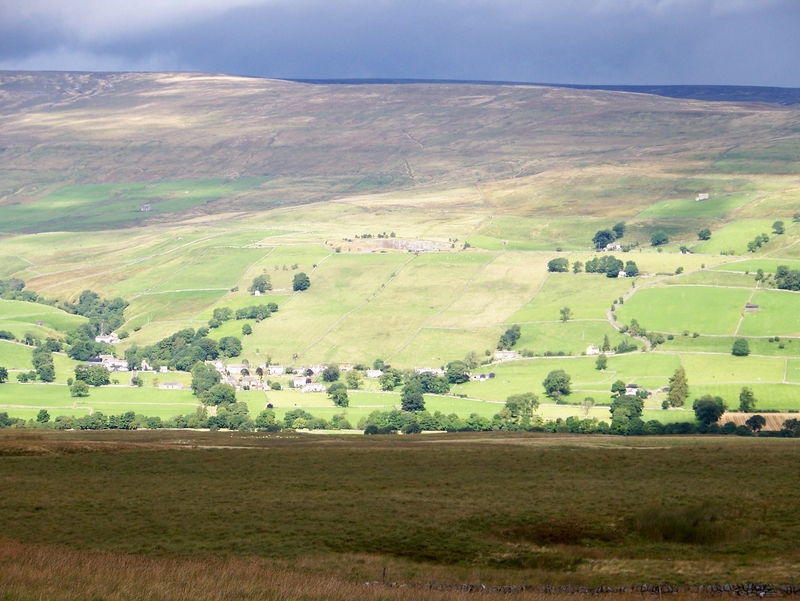 It was partly inspired by your recent trek, because I’d never walked north from the A66 through Teesdale and when I read your account I thought it was about time I did it. Mind you, I didn’t stop for cakes and fry-ups every five minutes. And the weather was colder and wetter! Hello Alen – just catching up with your adventures. 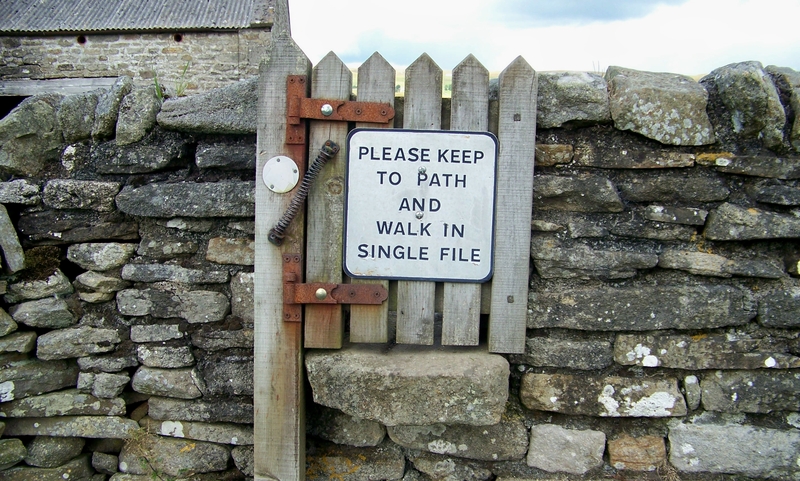 I think the single file notice relates to walking across the meadows in the spring when the flowers are sprouting. Glorious sight when they are in their prime as I’m sure you know. That’ll teach you to impulse purchase. Hi Pete. It turns out to be one of my better impulse purchases. You can get bogged down with reading all the spec for outdoor gear to the point where you can’t make up your mind – so when something that looks like a bargain gets thrust under your nose it’s hard to resist. That’s the way, keep them scared! A great post and I’m looking forward to the sequel! I love your photos and descriptions. Wonderful countryside, and more wonderful place names! I’m intrigued by the turf-roofed houses – those roofs (I want to type ‘rooves’) are huge! Why?! What were they used to hide? I would be just as outraged as you by the lack of apostrophe, and by the instruction to walk in single file. 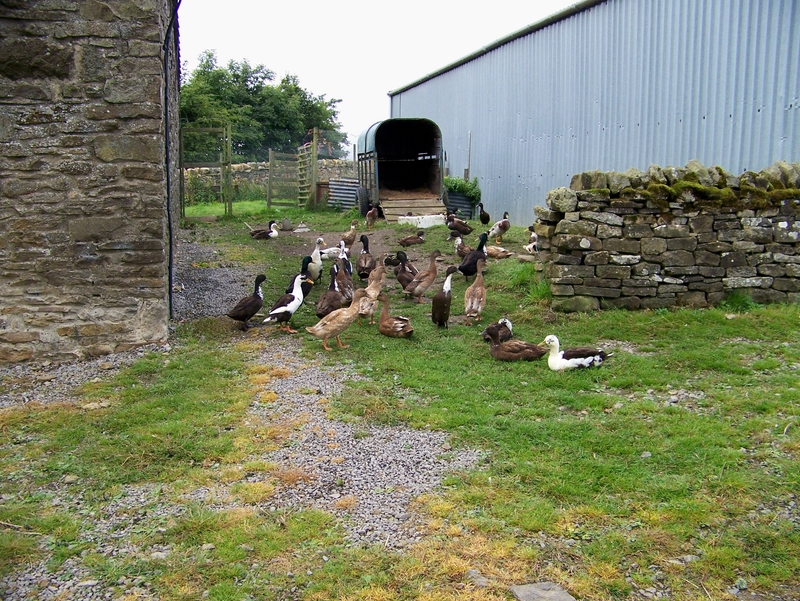 The ducks appear to be staging a mass protest about that! By the way, I’ve seen lots of farms and places called ‘Intake’ or ‘Intak’. Do you have any idea where it comes from? Hi Jo. Thanks for that. I used to type rooves all the time, and it’s only recently I’ve got out of the habit. The English language is a strange beast. I don’t know anything about the buildings and I was hoping someone might shed some light on them. Not only are they turfed, or thatched, but they are pitched at an incredibly steep angle. If I’d had anything about me I’d have knocked on the door and asked the owners, and I’m sure they would have been more than happy to oblige. I might pop back soon and find out more because it’s only 15 minutes up the road. 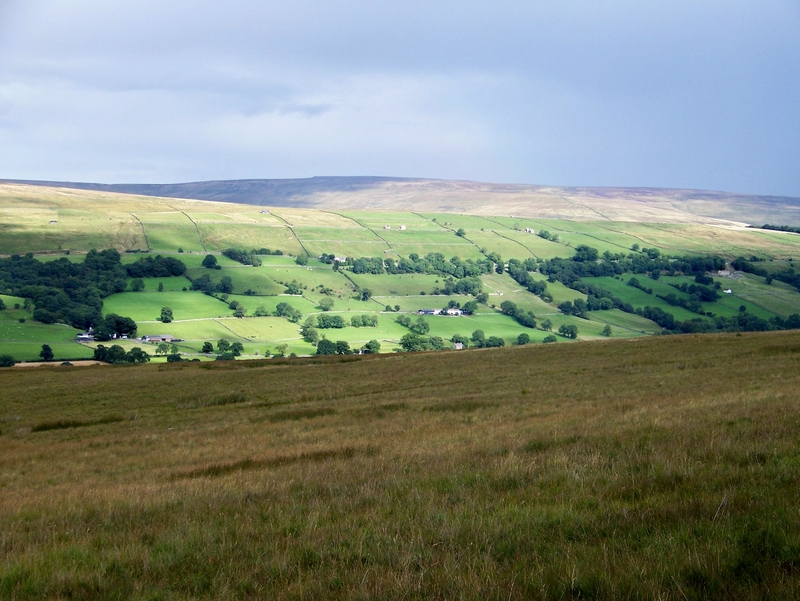 Intak fields, or intakes, are the highest fields on the valley sides before the rough fell is encountered. They are usually situated above the more productive ground and hay meadows and just used for grazing. I would imagine the name originates from the practice of herding the flocks from the open fell and down into the “intakes”. The term has also survived in place names and farm names, as you say. They certainly are pitched at a very steep angle – you’d think that would be inviting wind damage so it would be interesting to know the reason! Thank you very much for explaining ‘intake’ – that makes good sense. I will remember that! I shall return and make inquiries. 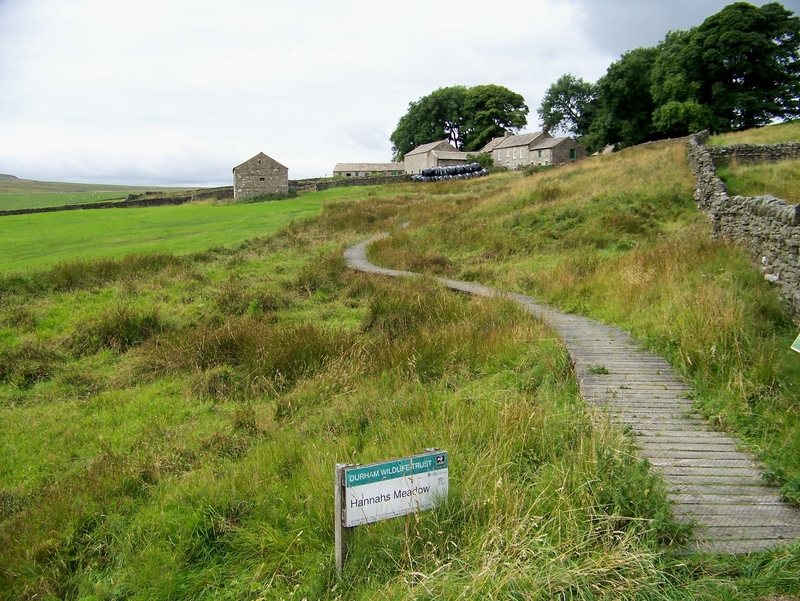 Alen, this is the next section I have to do in my very drawn out walking of the Pennine Way which I started back in 2007,so I still have half of it to do. I better get on with it or at this rate I will finish it in 2017 🙂 Great writing as always. Well you’ve reached a splendid section, Mark. And now you’re settled in your new house – which looks very grand, may I add – there’s nothing stopping you picking up the trail. Catching up with more of your posts, Alen. Enjoyed the the Wilfred Owen echoes in your report and share your suspicion about unscientifically based recommendations concerning alcohol intake from the medical profession! Hi Will. Good man. I’m a big fan of Owen’s work. And on the other point, I have a colleague, a cricket-loving, grey-bearded, fly-fishing, real-ale-supping type who insists that the NHS alcohol unit levels are just numbers that someone pulled out of a hat and have no solid foundation in science. I’ll go along with him on that.